Diabetic retinopathy, also known as diabetic eye disease, is when damage occurs to the retina due to diabetes. It can eventually lead to blindness. Diabetic retinopathy is an eye condition associated with diabetes. It is caused by the deterioration of the blood vessels which nourish the retina at the back of the eye. As these blood vessels weaken, they may leak fluid or blood, damaging the delicate retina. Severe visual loss – including total blindness – can result if treatment is not begun early. Although diabetic retinopathy is easily detected during a routine eye examination and treatable with laser surgery in the early stages, it is the leading cause of new blindness in adults. Six out of ten people who have had diabetes for more than 15 years show symptoms of retinal damage. Others at risk are those who have high blood sugar levels or poorly managed diabetes; people with diabetes who have high blood pressure; and women with diabetes who become pregnant. This is the most common cause of vision impairment in people with diabetes. It occurs when the blood vessels weaken and leak a clear fluid called serum, and sometimes fat, into the surrounding retina. The fluid causes the retina to swell and central vision becomes blurred when the macula (area of sharp vision) is affected. The serum is reabsorbed by the vessels and so blurring lasts a few days at a time. However, if the leakage occurs faster than the serum can be reabsorbed, then the blurring will be continuous. The fat deposits are called exudates and are reabsorbed more slowly than the serum. The blood vessels can also bleed into the retina, but vision is not usually affected because the haemorrhages are very small and do not occur within the central macula. If the central vision is not affected, there may be no symptoms at all. There is no pain or outward symptoms such as bloodshot eyes, irritation or discharge. Visual symptoms include blurred or distorted vision, problems with reading, watching television and recognising faces, difficulty with glare and night vision. This occurs when new blood vessels grow or “proliferate” over the inner surface of the retina and may even grow out into the vitreous, the clear jelly-like substance inside the eye. These new vessels, which grow to replace blocked vessels, are weak and bleed easily into the vitreous, causing the vision to become cloudy. Depending on the amount of bleeding, the cloudiness can dissipate within a few days to a few months. If the bleeding occurs frequently, scar tissue may form between the retina and the vitreous. This may then contract, pulling the retina away from the back of the eye. This is a detached retina and treatment needs to be prompt to prevent complete loss of vision in that eye. A diagnosis can only be made upon a full examination by your ophthalmologist. 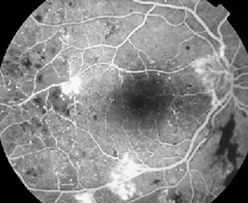 An examination may also include fluorescein angiography in order to determine how far the condition has progressed. This involves the injection of dye into the hand or arm. The passage of the dye through the blood vessels supplying the retina can then be observed and photographed. The most effective way to deal with diabetic retinopathy is prevention. Early diagnosis and correct management of diabetes is essential. Once diagnosed, regular checkups with your ophthalmologist are vital as early treatment improves the chances of preserving vision. Once it has been determined that background diabetic retinopathy has developed, your doctor may advise laser treatment. Laser treatment is used to seal leaking blood vessels. This is to preserve remaining sight rather than to restore lost vision. It may also be necessary to laser the macula if the swelling does not resolve. The treatment primarily works to maintain central and colour vision although some peripheral and night vision may be affected. This type of treatment is usually spread over a number of sessions, due to the large amount of retina being treated. If extensive proliferative retinopathy has developed then a vitrectomy – surgical removal of the vitreous – may be needed. This will remove longstanding blood and scar tissue from inside the eye and maximise the remaining vision. If this surgery is needed, your doctor will discuss this in more detail with you. If you are diabetic, it is essential that you have a check with your ophthalmologist regularly. Remember that treatment for diabetic retinopathy works to maintain your vision at its current level, so early detection is vital.